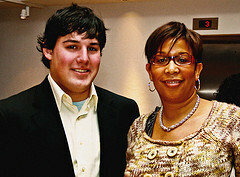 Nicolas Barajas with Cynthia Curry, a news designer at the New York Times. Nic is now working part-time for the Times, doing news design with some of the same people he met in Tuscon. I spent my winter break about 3,000 miles away from home in Tucson, Arizona, at the New York Times Student Journalism Institute. I was one of just 20 students selected from across the country for this prestigious, two-week program. I met fellow budding journalists from the University of Arizona, Colorado State University, Brigham Young University, and Florida International University, to name a few. Our first full day was spent in lectures, listening to editors from the New York Times and other newspapers speak about a variety of subjects -- how to structure an interview to get quotes that tell the story, what resources to use for information gathering in Tucson, who to talk to when you're covering a particular beat, and how to use audio slideshows and video clips to tell a story a different way. But after that first day, classroom time ended. The newsroom opened up, and we immediately got to work on pieces that would be featured on our website and on a newspaper to be made at the end of the program. Each day, students were assigned daily stories to cover from around Arizona. Some students focused on sports, others covered the local and state courts, and still more found feature stories in the area. Everyone was assigned a major project. Many of the students were reporters and were given “enterprise” pieces, or longer-form journalism, to be put on a website we were running through the institute. The photographers were assigned a photo essay, a picture-driven story of their choosing, as their project. My project didn't involve reporting or photography. My job was to design the newspaper. From cover to cover, with the help of design editors from the New York Times, I created the layouts for our news pages, photo essays, and student profiles -- a complete 16-page newspaper, with no advertising on any of the pages. But that wasn't all. I also assisted with some of the design for the website and even got to do some video editing. Other reporters produced podcasts that summarized each day’s stories and recorded video pieces to enhance their reporting. But it wasn't all work all the time. We put in a lot of effort, but our editors reminded us to get out of the office once in a while and helped us do that by taking us out for a meal or a cup of coffee. The best part of my experience was working side by side with editors from several of the country’s top papers, including the Times, the Boston Globe, and the Santa Rosa Press-Democrat. These editors helped us focus on meeting our deadlines and taught us how it’s really done by the professionals in a fast-paced newsroom. At the end of 10 days, we had a reception at which all of the articles and photos in our printed newspaper were showcased. It was well received by everybody in attendance, and the speaker for the evening -- Rick Berke, assistant managing editor for news at the Times -- said that it looked just as good as the front page of the New York Times! Of course, there’s no way I would have even been accepted for the program if it weren't for my experience with the Ithacan, the weekly campus newspaper for Ithaca College. I've been working on the Ithacan for more than three years. It’s where I learned how to design pages, create websites, and put together multimedia storytelling. As the Ithacan’s online editor, much of my work involved making the website as good as it could be. The editors at the institute showed me different ways of thinking about what we do as journalists and really helped me grow as an editor myself. I was able apply what I learned there to what I did at the Ithacan -- and beyond. My work at the Ithacan was the starting point for learning how to be an effective journalist, and it opened doors to great opportunities like the one in Tucson with the New York Times. I hope to work for the crème de la crème of newspapers, and if all goes as planned, the Ithacan will help me reach that goal as well.